Received a Design Award of Merit in 2008 from The Association of Licensed Architects. Located on a prominent commercial site on 159th street in Tinley Park, this new construction three-story self-storage facility utilizes clean modern lines and crisp geometry to make a bold architectural statement to passing commuters. The 65,532 sq. ft. structure houses approximately 600 storage units, a sales office, public restrooms, and a manager’s residence, all serviced by two elevators and two interior stairs. 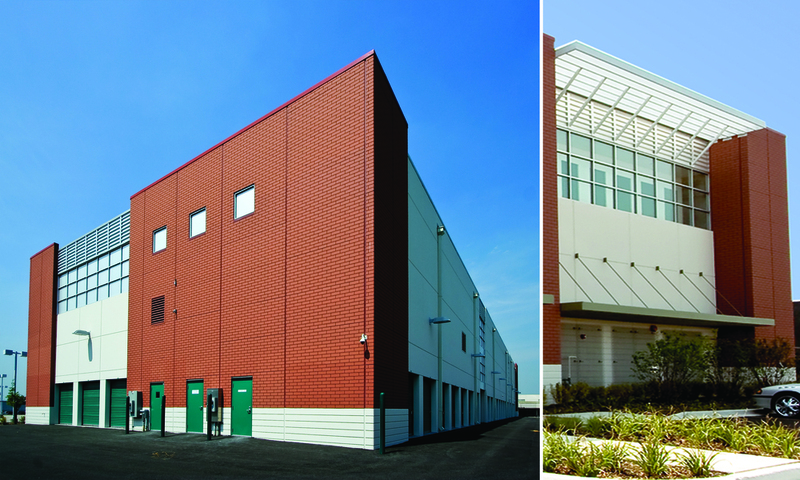 Modern building façade primarily composed of alternating red brick, patterned and smooth precast concrete panels dramatically articulated with vertical fields of glass, metal panels and sun screens.